Rando Scout Award - a new challenge! Eager to explore new routes? 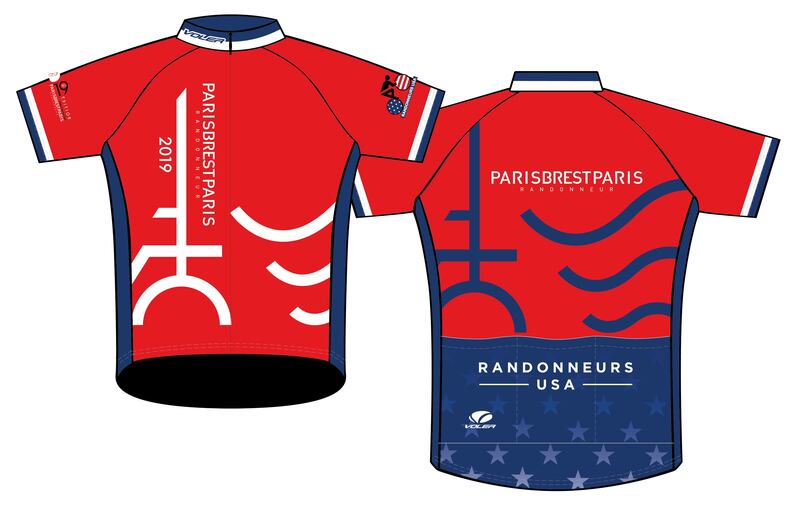 The Rando Scout recognizes RUSA members who have ridden at least 25 distinct routes in brevet, populaire, or grand randonnée (1200km and longer) RUSA events. (Permanents do not count.) The route must be in the RUSA Brevet Routes database and be linked to the event ridden by the member. There is no time limit to accumulate routes. Members do not have to apply to be recognized. There is no physical award associated with this recognition. 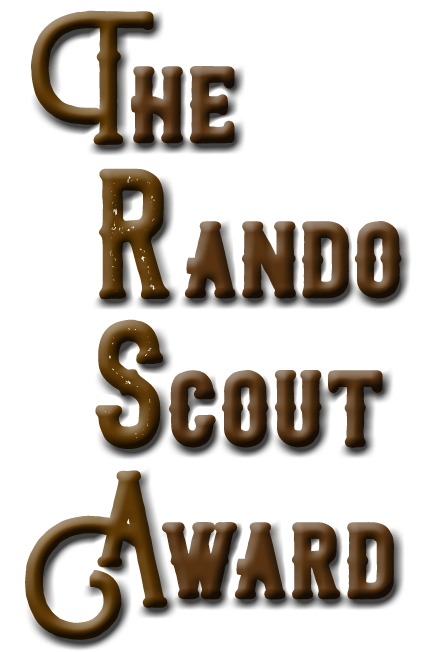 See the Rando Scout Award page for details, and to view those who've already achieved Rando Scout status. Group Order ended April 16. Jerseys still available for production on demand from Voler - order here. ... also, caps and vests available! Are you a K-Hound or an aspiring K-Hound? The new K-Hound jersey is now available for purchase by visiting the Voler RUSA Collection page. 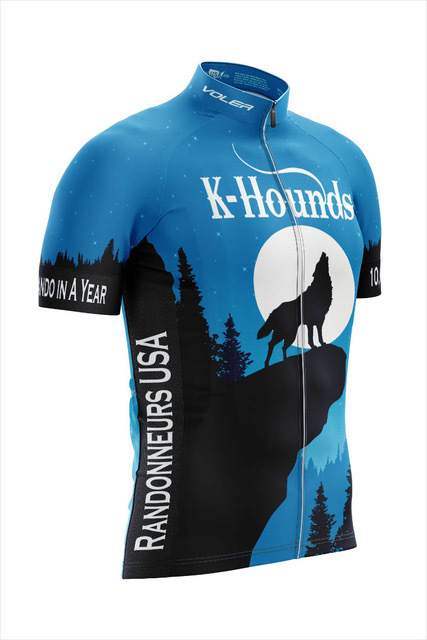 This jersey commemorates the RUSA K-Hound award - for completing at least 10,000 km in a year in RUSA rides. Order now and celebrate your K-Houndedness. Woof! Due to restrictions in our insurance coverage, minors can only ride events and permanent routes in Florida or Alaska. In Florida and/or Alaska, a parent/legal guardian must sign a waiver for minor participants. The list of eligible states may change as RUSA Board obtains additional information regarding the insurance coverage issues. See the Waiver Guidelines for this and other details. We've posted new Waiver Guidelines and a "sample" Waiver for use by RBAs for Brevets. There is also a Waiver for use by Perm Owners. Please read the guidelines as the legal requirements for waivers may vary depending on legal jurisdiction. Here is a list of the personal injury statutes of limitations. We hope that by end of December, members seeking to continue P-12 and R-12 streaks, and K-Hound aspirants will have been able to achieve their goals. If because of the Perms program suspension in early December you haven't been able to by 12/31, you will be allowed to perform make-up rides in January, 2019. P-12 and R-12: in the month of January, you may ride a 100k permanent populaire towards P-12 credit and/or a 200k permanent towards R-12 credit. Distances over 100km and 200km, respectively, will be rounded down to 100km and 200km when we process the make-ups. K-Hound: If you would have been able to reach K-Hound status but for the one-week permanents suspension, you can apply to ride make-up permanents in January. Contact Dan Driscoll for details and to report your intention to ride make-ups in January. You should do this before riding make-ups. Thank you, Dan! Procedure: Apply to the route owner and sign the waiver in the normal way, do your ride(s), submit your materials, and wait for the result(s) to be posted. At that point you can register your ride(s) as make-up, using a form on the website. We will take care of the rest. Your rides will be credited to dates in December, for perms of 200k and/or 100k distance. This means they will count towards 2018 distance and awards for which perms are eligible, and will not count towards 2019. Thanks again for your resiliency and support during the early December Permanent suspension, and for your flexibility in this make-up scheme. 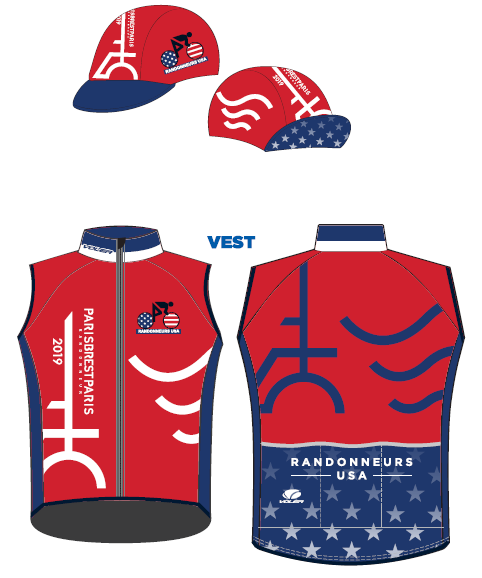 The deadline for nominating a RUSA member for the prestigious American Randonneur Award is coming soon. If you'd like to read more about the award or make a nomination, information can be found at American Randonneur Award. We are pleased to announce the resumption, effective immediately, of our Permanents Program, as well as the return to normal operations of our Brevet Program. To our members for your patience and understanding, and for the emails of support we received. Thank you. To the dedicated team of RBAs, many of whom stepped up on very short notice to offer additional riding opportunities in your regions, for your flexibility, patience and thoughtful input throughout this process. Thank you. And to the hard-working volunteers on the Brevet Coordinating and Insurance Committees, for all the extra hours you put in without complaint during this very busy period. Thank you. We know that the week-long pause in the Permanents Program may have made it more difficult to plan your December rides to continue or complete your pursuit of these prestigious awards. Wherever possible, we encourage you to use the remaining 24 days of the month to achieve these goals. Aspirants for whom the week-long pause made the achievement of those goals impossible will be offered a make-up allowance. Details will be posted on the RUSA website within the next week. Dear Members, it is with great sadness that we inform you of a fatality that occurred during a RUSA event this summer. Our thoughts are with the family and friends of the deceased, as well as her fellow riders and the local randonneuring community. Sadly, the rider's family has brought a lawsuit against RUSA. While we have insurance to cover any eventual resolution of the lawsuit, the incident is unfortunately complicating the renewal of our current insurance policy, which expires this Friday 11/30/18 at 11:59pm. We believe we have a short term solution in place to cover upcoming RUSA brevets, but regrettably that solution does not cover the permanents program. Without insurance, we can not sanction any permanents after this Friday, and must suspend the program until appropriate insurance can be found. Many riders are working on R12 and P12 awards and we want to assure you that the temporary suspension of the permanents program will not impact your ability to earn these awards. We are still working out the specific details but we want you to know we are very aware of how important this program is to everyone. In some regions RBAs are already offering events, or may be able to calendar a 100K RUSA Populaire and/or 200K RUSA brevet on short notice. But regardless, members who are unable to attend one of those calendared events for any reason or who live in a region where they are not offered will be given some form of accommodation, which will announce as soon as we can. We are still hopeful that we will secure a new policy by this Friday that will cover our brevets AND permanents, but out of an abundance of caution we are sending you this notification now. We will update you again this Friday, and we urge you to check the RUSA website regularly for any immediate updates. We know that this information may cause consternation and concern from the membership. While we will do our best to answer questions you might have, we are unable to disclose any specific information about the fatality, the associated lawsuit, etc. Please know that your board and it's committees are working very hard to find a long term solution and will keep you regularly informed.